In a medium bowl, stir together the crushed tomatoes, diced tomatoes, chili powder, cumin, paprika, brown sugar, and salt. Set aside. Place the carrots, celery, onions, garlic, beef, and kidney beans into the base of a slow cooker. Pour the tomato sauce mixture evenly over the top of the beef and vegetables. Cover and cook on high for 6 hours. Taste and adjust seasoning as necessary- adding more chili powder if you'd prefer more spice. 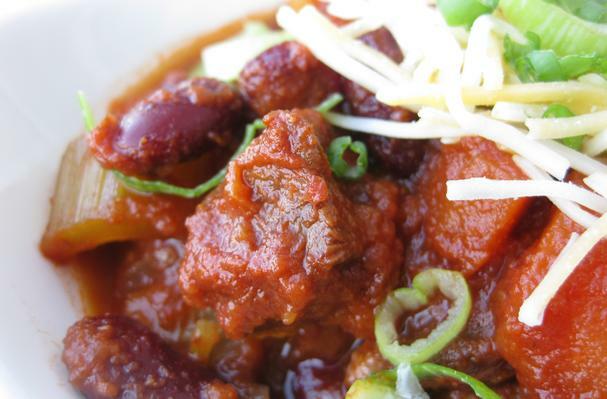 This slow cooked chili is bubbling with rich flavor. A smoky, spicy, and slightly sweet tomato base with fork-tender chunks of savory beef. Simmering the chili for such a long time deepens the flavor and allows all of the spices to blend well. And the best part? It couldn't be simpler!